In recent weeks, with the Blues starting to feel the pressure of the chase for a top four place, Kevin Mirallas has risen above the rest to offer Everton the magic ingredient that has turned losses into draws and draws into victories. Even in defeat, he has flourished, enhancing his reputation with every game. Fantastic goals and Man of the Match performances has propelled Mirallas forward as the central figure in Martinez’ Everton, with the Belgium international relishing the additional responsibility placed on his shoulders as the Blues have battled with a lengthy injury list. The recent surge in form completes a remarkable turnaround in fortune for Mirallas. Earlier in the season he was in and out and the side and despite contributing with several assists was rightly criticised for a lack of consistency. He would now appear to be benefiting from not having started every match in the first half of the campaign and he looks fresh and fit and starting to show the best form of his Everton career. A few weeks ago, Roberto Martinez, spoke to Everton TV and identified Mirallas as a key player for the second half of the campaign, the flying forward is already repaying his managers faith. “Kevin has been working really hard. He is one of those players who will benefit in the second half of the season from all the work he did in pre-season. “He is now probably reaching his peak; physically when he is at his best, it is difficult to stop him. Mirallas is certainly proving his manager right, since the turn of the year he has produced his best football of the season and has easily been the Blues best player in this period. He was unlucky not to score away at Stoke, hitting the woodwork on two occasions. Against Norwich he scored Everton’s second from a delightful free-kick and after scoring Everton’s only goal away at West Brom he was superb in the cup at Stevenage, helping the Blues coast into the fifth round. At Anfield, Mirallas was the one player in Blue to leave the field with an enhanced reputation and despite playing in an unfamiliar role as the furthest man forward against Villa, struck a late free kick to lift Everton back into fifth and on the coat tails of Liverpool in the race for fourth. 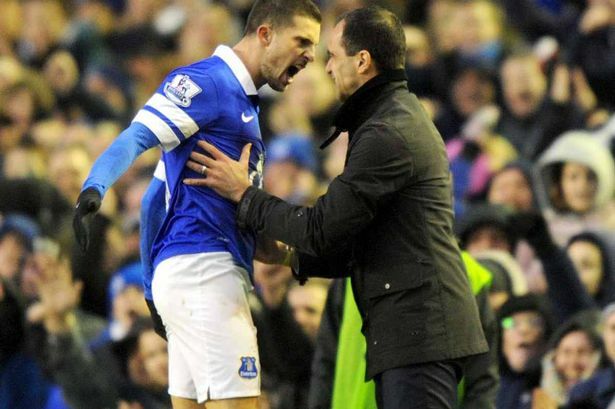 Mirallas’ goal celebration on Saturday, proved the bond between player and manager is as strong as ever, something which Mirallas was keen to talk about in his post-match interview. “My mentality changed, I can play strong and well in every game now. Before it was one game well, two games not so good. Now I can play well consistently in five games. “I spoke with the manager and I spoke with my father. Dad told me that I had good quality but sometimes my mentality wasn’t good and that had to change. “Earlier in the season he was a player helping the team but now he is desperate to set standards week in, week out. “And that, for a striker or attacking player, is very rare and that is why I had no problems of playing him in a different position and moving him around because I think he has that maturity now. “I have seen the change in him in the second or third month and he has become a different footballer. Three goals in his last five matches have brought his goals total for the season to four, a tally that he will look to increase in the remaining 14 league matches of the season. He will certainly want to improve on the six (nine in all competitions) he scored last season and will need to maintain the same rich vein of form if he is to achieve that. Mirallas has been creating goals for his team all campaign and has five Premier League assists to his name, putting himself just outside the top ten in the league. It is not just the goals and assists, this season he has created 47 chances for his teammates, 19 more than any of his Everton colleagues and the fifth highest in the league. With Mirallas in this form he could yet be the difference between a fifth and fourth place finish for the Blues. Central to Everton’s plan will be keeping the playmaker fit, with the Belgium set to be one of the first picks on the team sheet for the remainder of the season. Next Post Would the return of Jack Rodwell be good business?